Ever notice how your smartphone always dies at the worst possible moment, like when you’re about to take a great photo or are on a crucial call? You’re not alone. Last month, when market research firm YouGov surveyed people about their most desired smartphone features, “longer battery life” topped the wish list — by a mile. It beat out the next most popular response, a shatterproof screen, by more than two to one. These portable batteries can be charged ahead of time, and easily plug into your smartphone to replenish battery life. They come with different designs and features. Some are super slim, others have suction cups, and others still have digital displays that show you at a glance how much power is left in the bank. They come in varying strengths. One model can replenish a smartphone as many as six times! Some multitask as keychains, phone stands and chargers, turning them into a must-carry accessory. So what does this have to do with your marketing efforts? Consider the impact of your logo going everywhere with your customers — and employees. A near-universal need for extra power is a great problem to have, if you look at it right. The next time you’re pulling together a conference, or planning a special giveaway, a branded power bank is just the thing to make a lasting impression. 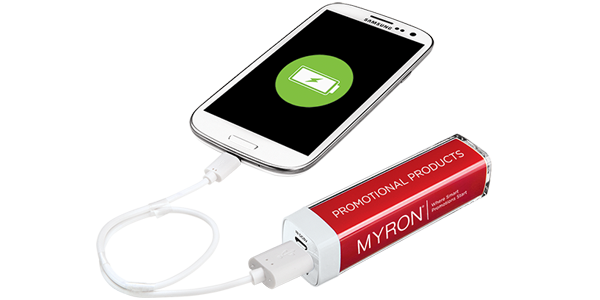 Custom-imprinted power bank chargers offer an effective and affordable way to raise brand awareness. Because they’re so useful, people seldom travel or even leave home without them, ensuring your logo is seen far and wide. They’re also a relatively new product, so they make a big impression and also attract attention from onlookers. In the long run, you’re boosting brand loyalty and affinity. Your customers and clients will see that you care about them, you’re attuned to their needs, and you think those needs are important. Now that you’ve cultivated positive feelings, your customers will become willing ambassadors for your brand, making it that much easier to ask them to tell friends and colleagues about your business. Check out our power bank buyer’s guide, and partner with someone who can bring your brand to life— literally.